13, no. 2 (April 2006): 367-73. 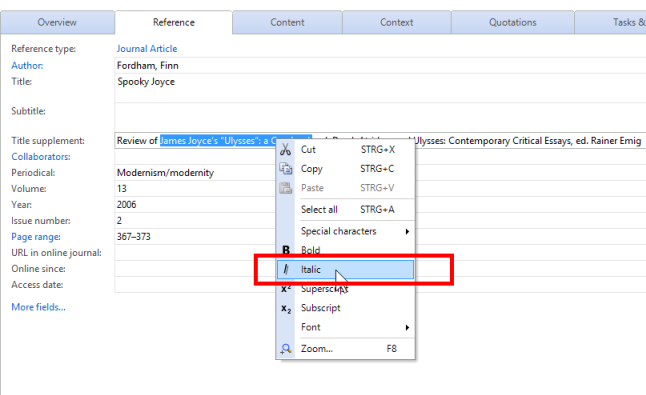 I found some other question and tip in the forum relating to citing reviews which suggests to put the essential part ("James Joyce’s “Ulysses”: a Casebook, ed. Derek Atridge, and Ulysses: Contemporary Critical Essays, ed. Rainer Emig") in title supplement. Is there a way to get the italics right then? Or what other solution do you suggest? Since our Chicago citation style uses the Title Supplement field for additional information needed in special cases, I've attached a customized Chicago style below which should give you the formatting you need. Please just save the file in the Citavi 3\Custom Citation Styles folder. Please let us know if there's anything else we can help with!